Today I’m trying something new, based on feedback from you! A few weeks ago, I polled my followers on Instagram. 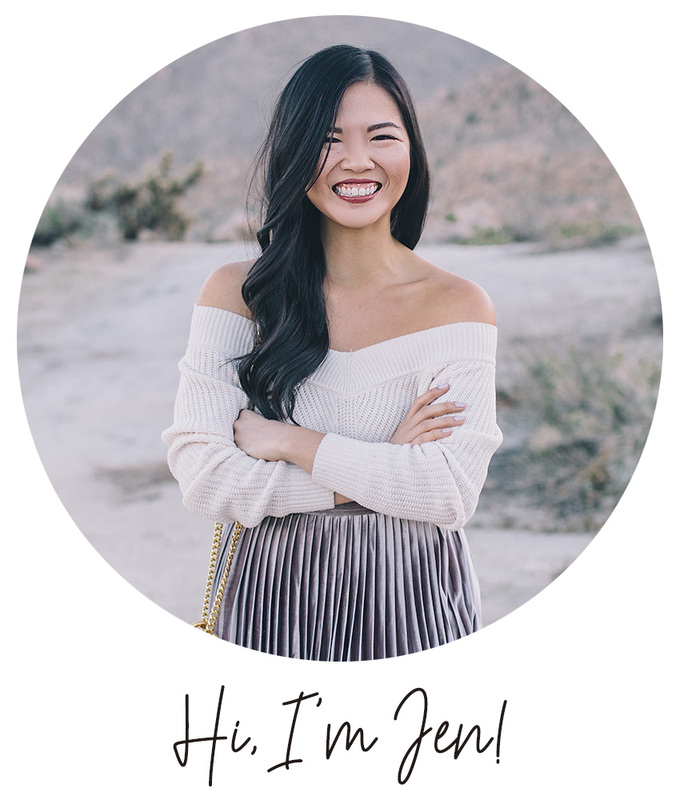 I asked them about wear they like to shop, how they would describe their personal style and what they’d like to see on my blog in 2019. Some of the most popular requests were for more work outfits and ideas on how to style a piece multiple ways. So here goes! I don’t know what took me so long, but I finally fell in love with the wrap dress last year (here’s a look at my very first!) It’s so incredibly flattering, easy to wear and damn it makes me feel good. 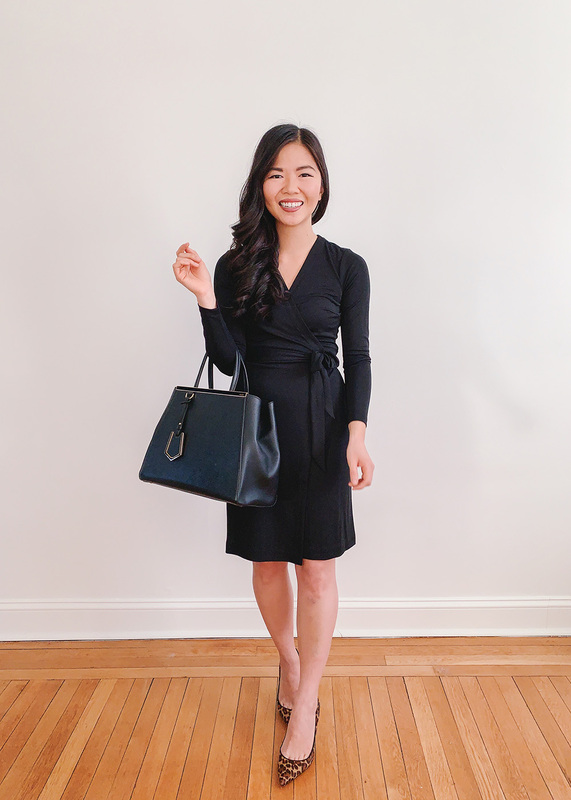 When I saw this matte jersey wrap dress in black, I knew it would make for the perfect foundation for many office looks to come. 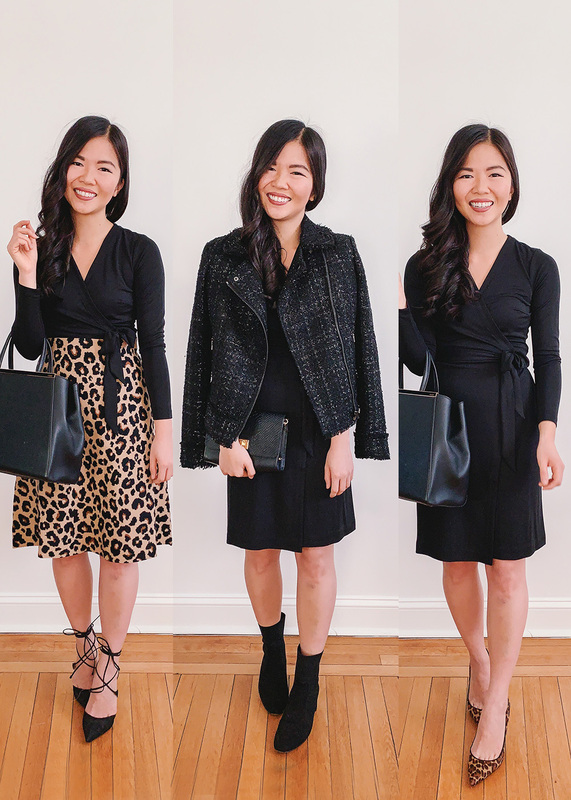 By itself, this black wrap dress is perfect, timeless and a great work staple. 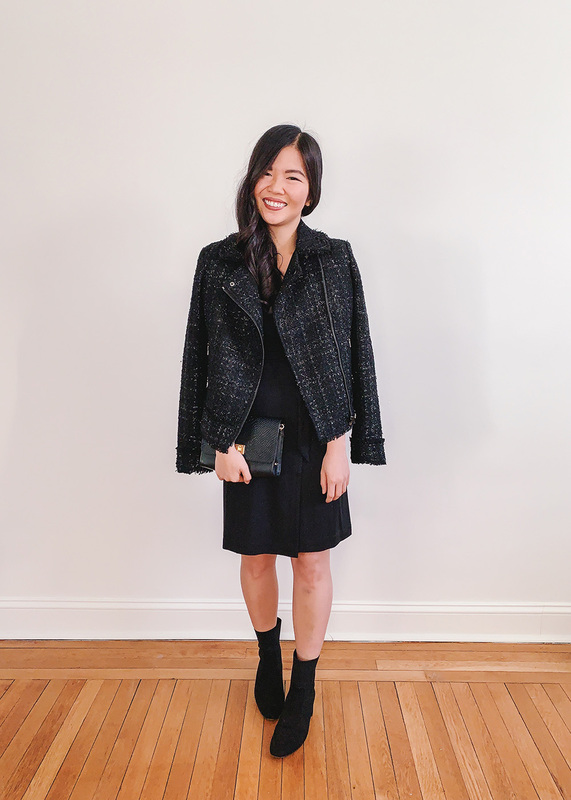 If you want to add a bit of texture for winter, I would go with this tweed moto jacket (wearing a size 0, but wish I got a 0P so the sleeves were tighter). You know these sock booties have been one of my go-to shoes since this fall and I love how it gives an other classy work outfit a little bit of edge. I think this outfit would look great with black opaque tights too! 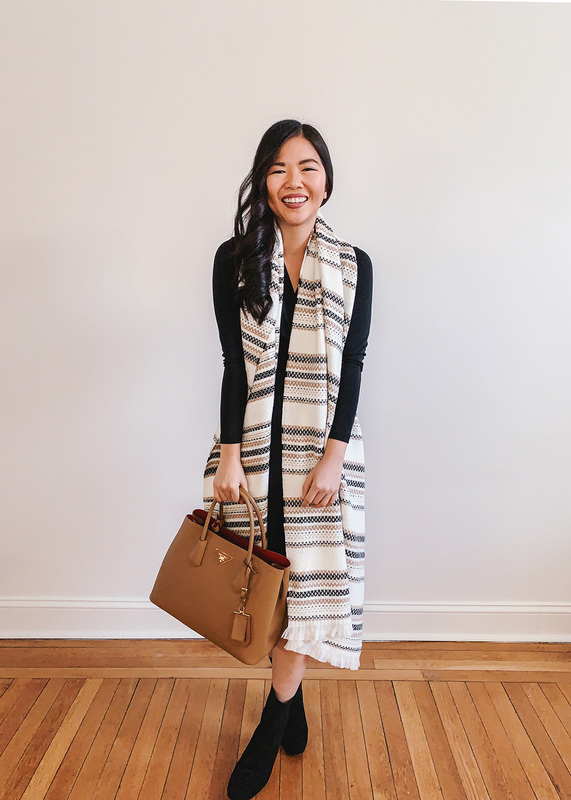 Keeping along the lines of texture, I love this striped blanket scarf. I think it brightens up the black dress and love the bits of tan that it adds to the color palette. Nothing earth shattering here, but it’s an easy switch that makes a world of a difference! 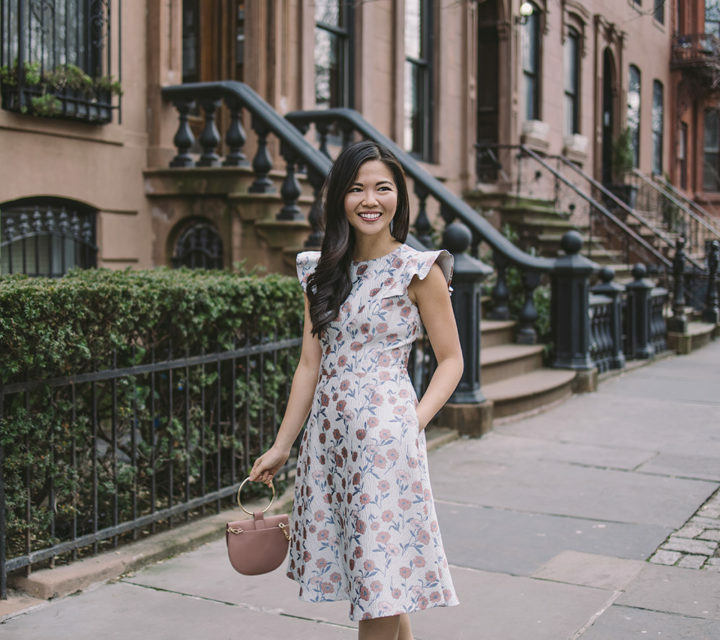 Last but not least – one of my favorite ways to transform a dress is to throw a skirt over it! 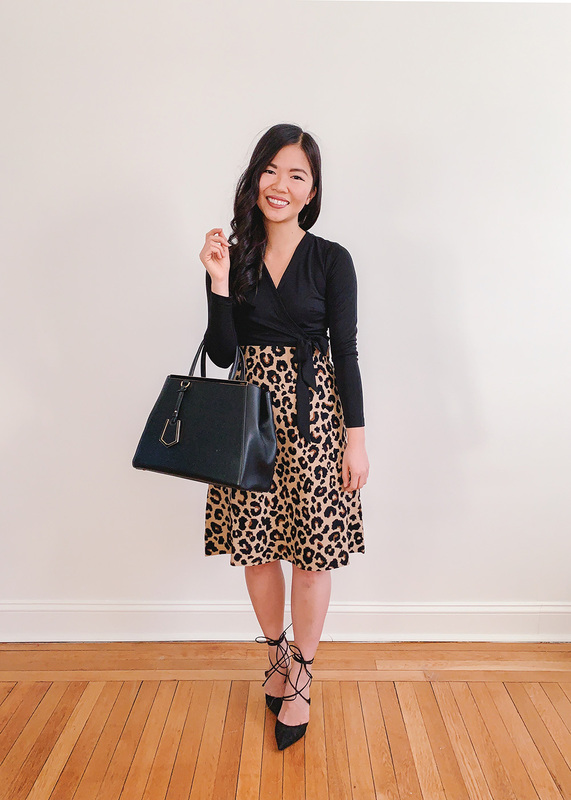 This leopard sweater skirt has the best thickness for colder weather – it’s almost sold out though, but this one is another great option. Which outfit is your favorite? Let me know in the comments section!